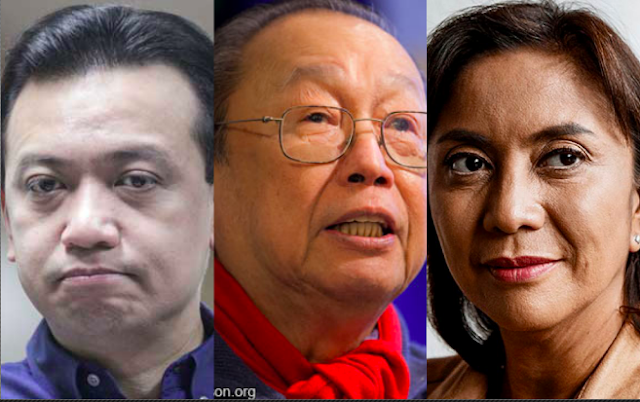 MANILA – President Rodrigo Duterte on Tuesday said Communist Part of the Philippines (CPP) founding chairman Jose Maria Sison, Senator Antonio Trillanes IV’s Magdalo and other groups opposing his presidency are in "loose conspiracy" to overthrow his government. “They have combined and we have the evidence and we have the conversation provided by a foreign country sympathetic to us,” Duterte said a televised tête-à-tête with Chief Presidential Legal Counsel Salvador Panelo at the Malacañang Palace. Duterte said the foreign country, which he did not identify, has agreed to his request to declassify the conversation and “show it to everyone”. “Nahihigop lahat eh. Alam nila ‘yan. (Everything can be monitored. They know it) So they were in constant communication. They are. It might be a loose conspiracy but they are into it,” Duterte said. He said the connection “will be shown maybe any day now”. The President, however, clarified that he will not stop the military and police if they believe he is no longer competent as president. “I said my clear stand on the matter. If the armed forces think that I am not competent, that I am not qualified to be sitting here as President, I have discussed this matter with them in a command conference, bahala kayo (it’s up to you),” Duterte said. “If you want another President, fine. I will not allow you to fight your own soldiers. So I would not allow my soldiers to kill another soldier or a policeman shooting another soldier. Eh kalokohan ‘yan (That’s ridiculous),” he added. Duterte said he has fulfilled his promise to the military and police but if they think Trillanes can give them better. “I urge you to go to Trillanes,” he added. He lambasted Trillanes for cursing all governments and committing ruckus when the latter spearheaded failed coup attempts against then president and now House Speaker Gloria Macapagal-Arroyo. Duterte said Trillanes did even dare to visit the poor soldiers who fought against terrorists during the five-month Marawi City siege last year. “I’m giving you (soldiers) a fighting chance. And when they said I doubled the salary, I doubled it long before Marawi. It was a campaign promise and I complied. Pero kung tingin ninyo mga sundalo na mas mabuti si Trillanes pati si Aquino (But if you think Trillanes and also Aquino is better), please kindly go to them and stage whatever you want. Pakita sa buong Pilipinas na kaya ninyo (Show to the whole Philippines that you can),” he said. “I am challenging the Magdalo to start now. Kung sigurado ninyo na sa inyo ang sundalo, fine (If you’re sure that the soldiers are with you, it’s fine),” he added. Duterte also denied Trillanes’ accusation that he is a dictator and that he is out to silence the senator and other opposition members. “I have yet to sign anything, ordering the arrest and silencing of anybody in the government, especially the critics. The fact that they are doing it every day, it goes to show that I’m giving them the time of their lives to just talk and talk. Wala naman (nothing). It’s an invented phrase, that silencing,” Duterte said. The President said Senator Leila de Lima, an opposition lawmaker, is jailed because she has pending case, referring to her illegal drug case. Duterte maintained that the New People’s Army is a terrorist group. “But everyday throughout the country, they are killing barangay (village) captains, those sympathetic with government, even soldiers. Those are violations of… they are terrorists,” Duterte said. Sison, as a terrorist, should face trial, he said.